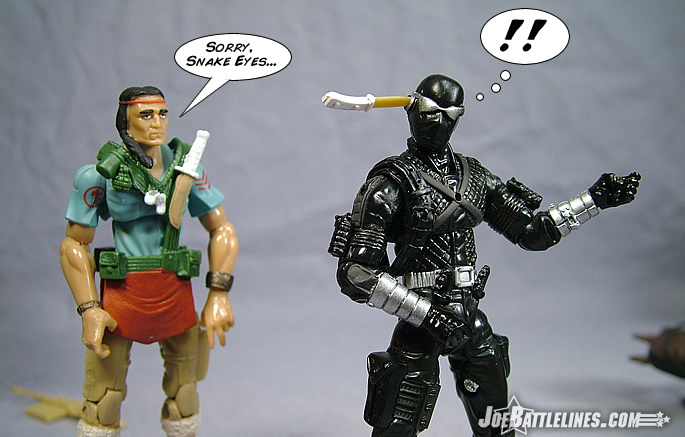 In 1989 the current GIJoe design team took a bold step with the character of Snake Eyes and moved the character’s design away from “commando” and firmly into the “ninja” category. The character was given his third redesign since the launch of the “GIJoe: A Real American Hero” line seven years earlier sporting a more steam-lined martial arts look. The figure was equipped with a variety of deadly “silent weapons” including a blow gun, sword, and three-sectioned “nunchuck” weapon, in addition to a flash-suppressed UZI. 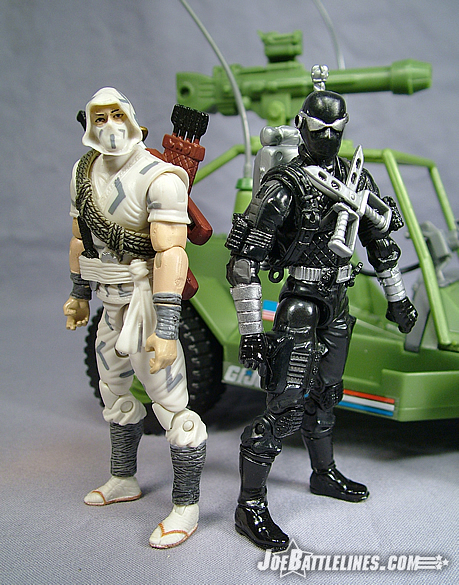 Martial arts were popular once more with the explosion of the Teenage Mutant Ninja Turtles onto toy store shelves and the GIJoe team’s original “man in black” was now the team’s premiere ninja. Nearly twenty years later, the design team at Hasbro has elected to revisit this design in the 25 th Anniversary line, giving fans everywhere a reason to once again revisit the store shelves. I’m just going to come and state that back in 1989 this was one of the last GIJoe figures I purchased. My interest in the line was waning as high school was hitting full stride and I picked up Snake Eyes more out of nostalgia than anything else. In fact, I seem to remember that he sat in my closet unopened for a few weeks before I decided to free him from his plastic prison and see “what all of the fuss was about.” Once again, Hasbro has done a terrific job of replicating the original character design with an updated flair. The key elements of the original uniform are present—the padded black vest, the silver forearm wraps, the silver “shades”, and the high black boots with the knee pads. Even the sculpted grenades found on the “bicep bands” are present, giving Snakes a few more surprises to drop on anyone in his path. However, in terms of sculpting Hasbro decided to take a few details a step further. 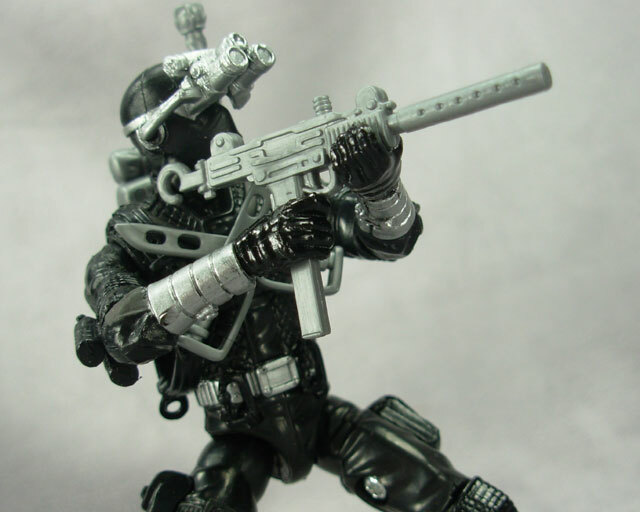 There are now sculpted carabineer rings on the figure’s belt, as well as a sculpted sling under the figure’s right arm—a perfect place to hang the figure’s included UZI submachine gun. 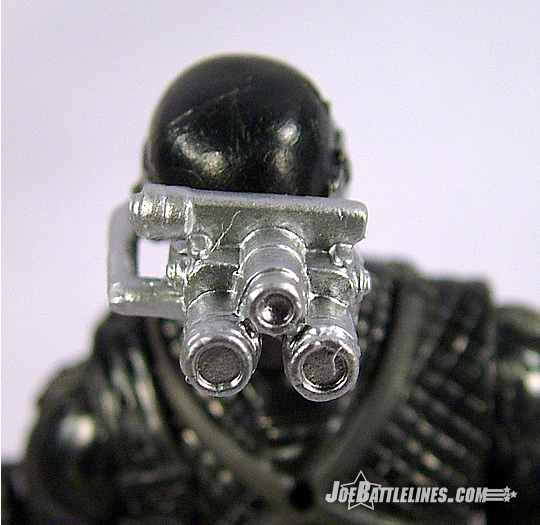 The original figure had a large earpiece sculpted over the right ear; this detail is now the mount point for the included night vision goggles. The only aspect of the design that I find puzzling is two “scraped” sections of the forearms located just below the elbows. The entire body of the figure has a smooth polished surface except for these two patches. In all honesty, it almost looks as though a knife-wielding collector took an X-acto blade and carved off sections of the mold. I’m not certain why these two patches exist and have the texture that they do but they’re present on all four of the Snake Eyes figures I’ve seen on store shelves in the past week so the detail appears intentional. Aside for this small oddity, the figure design is otherwise solid in a “Sam Fisher meets GIJoe” way. What’s your take on this latest version of Snake Eyes, Justin? Back in the day this was one of my least favorite versions of Snake Eyes out there. Comparing him to the ’85 version or the ’91 version isn’t even close, in my book, this figure just wasn’t nearly as good. It was heavy on detail but something just seemed a bit “off” about him. Whether it was the somewhat strange proportions of the older figure, or the bizarre accessories (a blowgun? Seriously?) 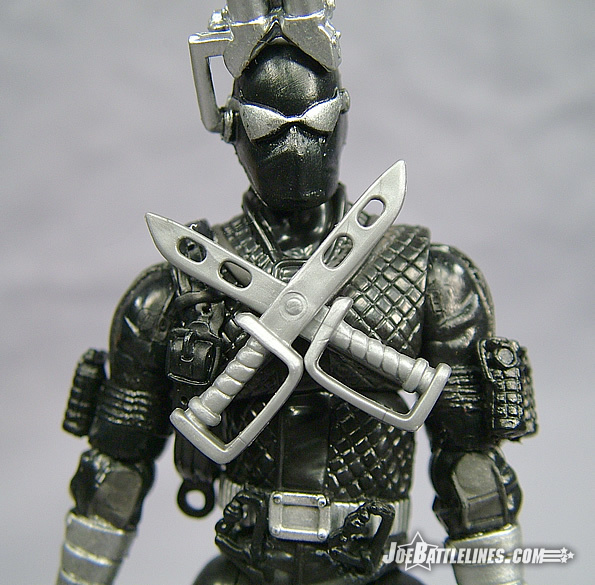 but this version of Snake Eyes simply wasn’t on my radar screen. I’m happy to say that nearly every issue I had with the original ’89 version of this figure has gone by the wayside, and this update is fantastic, taking full advantage of the benefits of newer style and articulation and we end up with one great new version of the infamous G.I. Joe Commando Ninja. His head sculpt is great and the detail on the torso sculpting is fabulous. Even with all of that detail crammed in there, this version of Snake Eyes still maintains the range of motion and articulation that has become the Anniversary standard and has a load of accessories worked into nearly every inch of the figure, as Fred said. 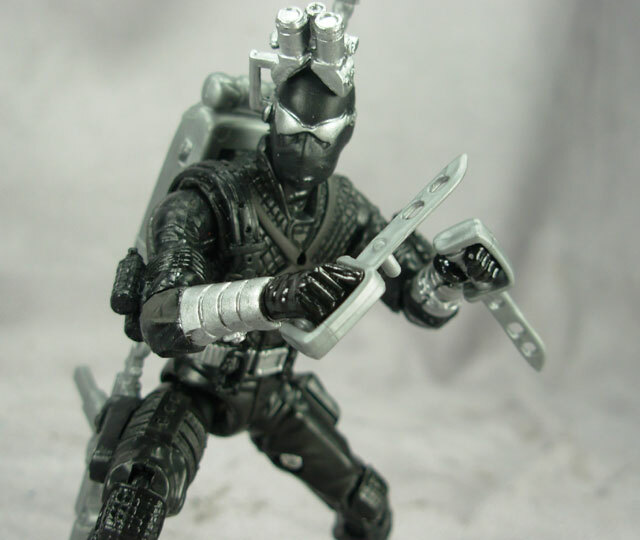 This figure is, without a doubt, the highlight of Wave 3, 2008 in my eyes, which is amazing considering this is just another Snake Eyes. I don’t recall the origin of the expression “all things in moderation” but that adage certainly applies to my opinions of this figure. 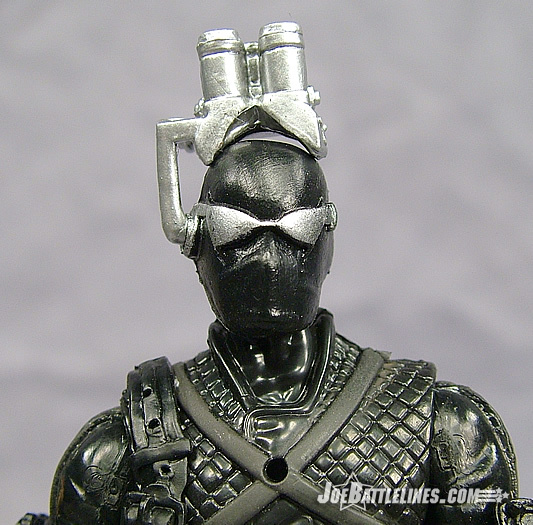 Hasbro took a very basic design for Snake Eyes and seemingly decided to “amp it up” a bit—and almost takes the concept of accessories too far. 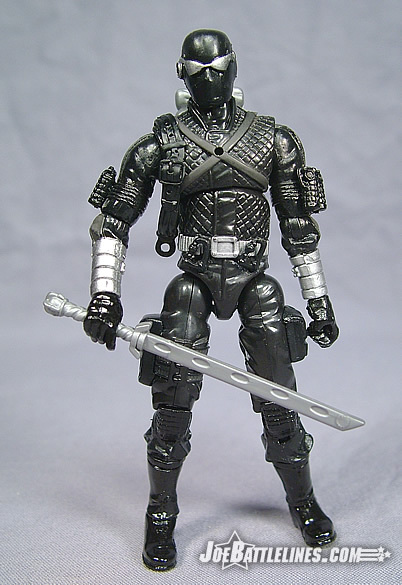 When this design for Snake Eyes debuted in 1989, the black-clad commando carried more accessories than any previous version of the figure. 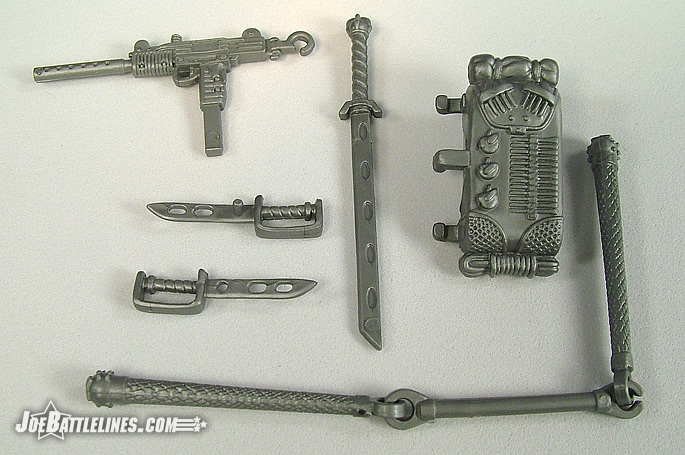 For the 25 th Anniversary version, Hasbro faithful reproduced the character’s UZI, pipe weapon, and sword. However, this veritable “arsenal of death” apparently didn’t suffice as the figure also has adjustable night vision goggles and a pair of removable knives. Both of these additions sound great on paper but the execution of them leaves something to be desired. 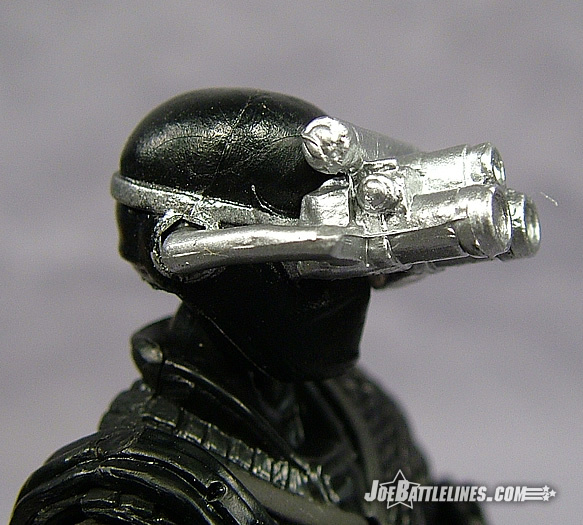 First off, the night vision goggles aren’t easily removable; instead the optics system is attached to the earpiece on the side of Snake Eyes’ head. The goggles can be raised and lowered over the figure’s eyes but removing them will leave Snakes with a gaping hole in the side of his head. (I’m oddly reminded of the character of Scorpius from “Farscape” who had removable cooling rods housed in the same location.) The goggles themselves are quite nice but the fact that they pretty much remain perched on the figure’s head is a bit distracting visually. The other enhanced detail is the addition of the removable knives that are located on the figure’s chest. The knives themselves are a great addition to the character’s kit but the short length of the post used to attach them to the chest means that they tend to fall off at anything more than a casual glance. The knives are also a bit larger than the sculpted versions found on the 1989 figure and tend to interfere with the figure’s poseability when left on. As a result, I foresee many collectors simply omitting the knives from the figure entirely. I’ll pass the keyboard over to Justin for his thoughts on this latest version of Snake Eyes. I think all of this detail and all of these accessories only exemplify how much the design of action figures in general has grown over the past two decades. Some times that growth does have somewhat of an impact on the playability of these figures, I will concede that point. Someone like myself who tends to pose these figures for various reasons (like dio-stories or reviews) get a bit frustrated when accessories fly off with the slightest twist of the figure. But the fact that these twin knives are removable is simply an awesome added feature of the action figure. They look terrific and on my particular figure they actually stay attached on his chest pretty darn well. 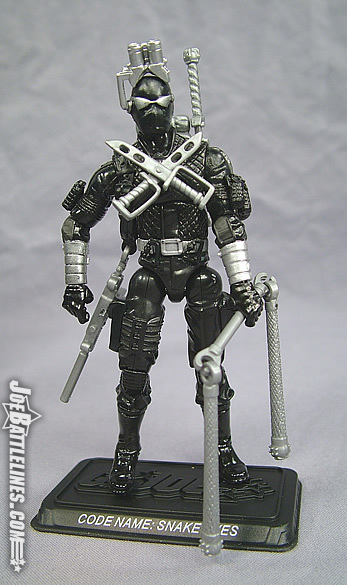 Now another thing this version of Snake Eyes does well is taking original concepts that didn’t quite make the cut for the figure and include them, and include them well. With that hook on the end of the machine gun, I’m sure many fans wondered where the weapon hooked on to? Well, now we have a sling, something that must have been conceived of back in the day, but couldn’t be produced for some reason. With that earpiece, it also seems as if they had planned for some sort of eye gear, but weren’t able to do that back then, so they are remedying that fact now. I love it. Personally, I think the goggles are one of the coolest aspects of the figure and I have no problems with the hole in the side of the head. After all, every single figure has a hole in the back and the bottom of each feet as well, what’s the difference here? It stays well and the goggles fit perfectly. An awesome touch. From head to toe this figure is loaded with gear, and while that somewhat negatively impacts his playability, his articulation is fairly well maintained and he can achieve any pose that you want. Very cool figure. At this point in my GIJoe collecting life I’m finding it harder and harder to get excited about another version of Snake Eyes. 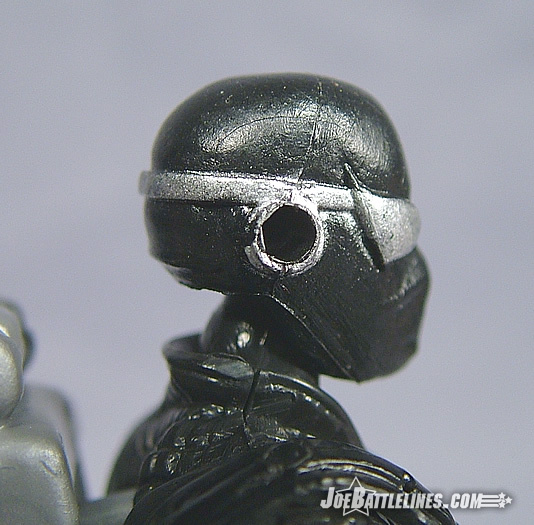 In the original ARAH line, there were essentially seven Snake Eyes figures released. Since 1997 we’ve gone from version 7 to what is essentially version 34, according to YoJoe.com. I realize that the folks in marketing view Snake Eyes as GIJoe’s Wolverine but the over proliferation of versions of the character are starting to wear me down a bit. I won’t like—aside from some minor issues with the removable knives and the night vision goggles, this is a decent figure for the 25 th Anniversary line. Unlike many figures, his proportions are solid and his articulation is functional. All of the figures I’ve seen in stores have a tendency to lean to the right but otherwise this is the “Splinter Cell” version of Snake Eyes. Yet I find myself having a hard time getting truly excited by another in a long string of variations and repaints of the same character over and over ad infinitum. 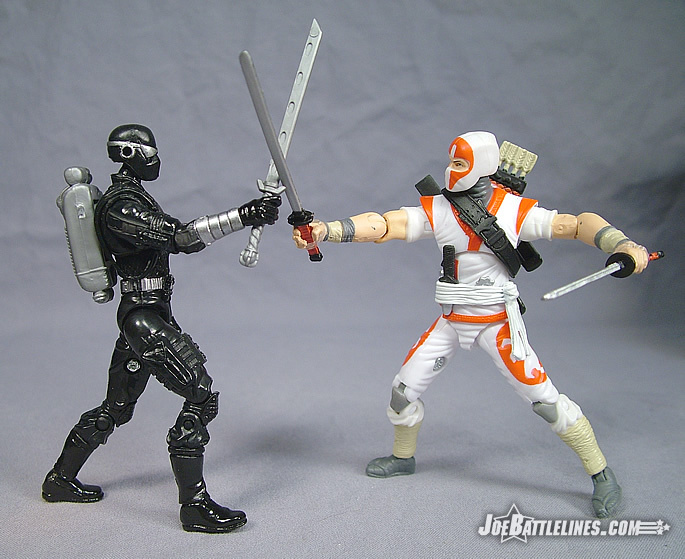 Still, fans of Snake Eyes will most likely want to add this latest incarnation to their collections. Personally, I’ll stick with the more definitive v2. What are your closing thoughts, Justin? 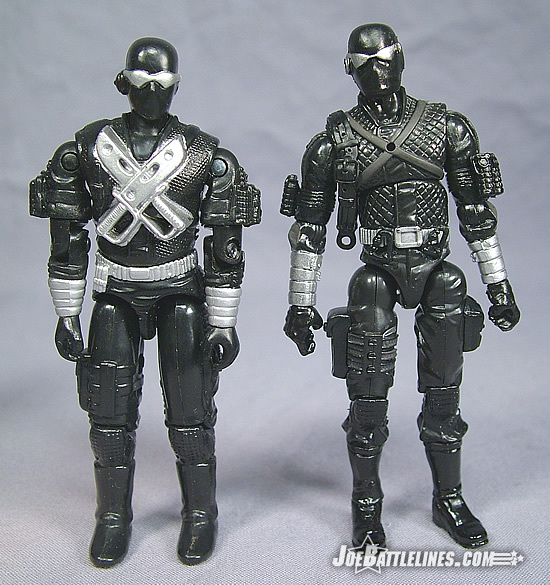 Snake Eyes as a character has actually never really excited me, I much prefer the more obscure Joes and COBRA’s out there, but I can appreciate that the retailers want Snake Eyes on the shelves as much as humanly possible. 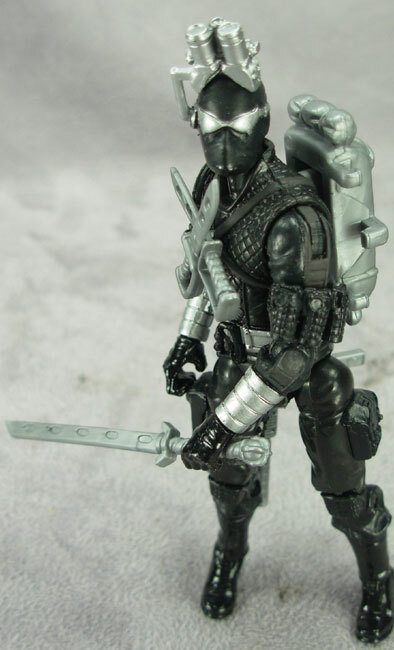 Still, Hasbro does a great job giving us a nice update to the ’89 version of Snake Eyes that has a ton of gear and it looks great. 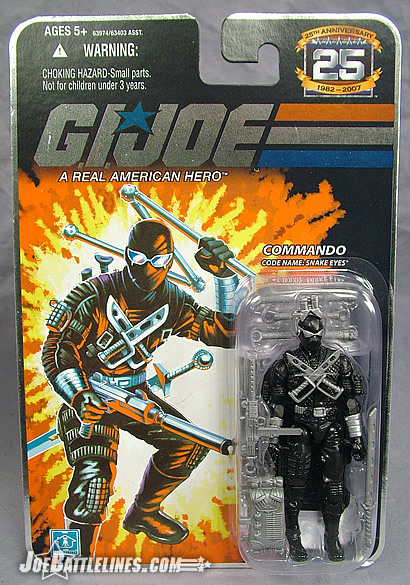 Yeah, I’m just as sick and tired of Snake Eyes ad infinitum as anyone else, but these days in retail sales you have to do what you have to do, and if they need to overproduce the Joe Commando, at least they can keep making good ones like this. My favorite figure of this wave, which is an impressive feat, since I’m normally very luke warm on Snake Eyes (even with new tooling involved). This is my current default version of the Joe Commando on my Anniversary display shelf, and it will take quite a bit to move him from that spot.